At TricksRoad, we have talked a lot about the different WordPress hosting companies and how they are performing. To continue the journey, today we are going to talk about another leading WP hosting company A2 Hosting in this A2 Hosting Review post. 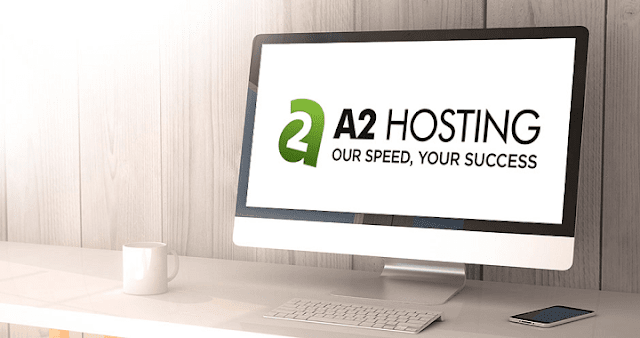 If you are not satisfied with your current hosting due to whatever reason, you can go for the A2 Hosting. The reason I have listed in our SiteGround Alternatives post. It was August 2001, when the foundation of a company named Iniquinet was done. Since then they have grown rapidly. And after around two years, they went global and rebranded themselves as A2 Hosting. A2 Hosting is known as developer-friendly and was the first company who started PHP5 on their servers. And it was 2011 when they started providing VPS hosting to their clients. Again in 2013, they provided SSD hosting for all types of hosting including shared hosting. When other companies charge 5x more for SSD, A2 Hosting incorporated this for free to their entire infrastructure. SSD drives are mainly known for their speed and it has been seen that after using SSD drives, the speed increases by 50%. Currently, A2 Hosting has thousands of customers globally and provides 24x7 supports to their customers. Also, their technical support team is one of the best in the industry and helps you resolve the issue on call. Let’s talk more about A2 Hosting Review in detail below. For more details, you can also check this review of a2 hosting. We will talk about each of these A2 Hosting plans in details in the next section in this A2 Hosting review. A2 Hosting provides one of the best solutions for the shared hosting. 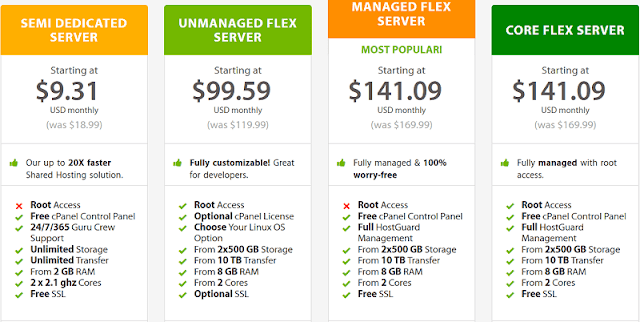 You can find the pricing details of A2 Hosting Shared hosting below. I recommend you the Swift plan to go with the shared hosting where you can host multiple websites. 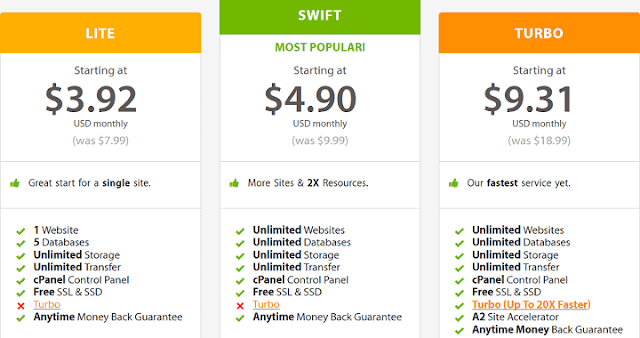 If you just have one website, you can go with Lite which comes at $3.92 but still, I recommend Swift plan where just by paying $0.98 extra, you can host unlimited websites. A2 Hosting also provides amazing solutions for the VPS servers as well. So, if you are a high traffic site and want to move from shared hosting, you can go with the below plans with A2 Hosting VPS plans. They offer all kind of managed, unmanaged, and core VPS hosting services. If you still need something more than VPS hosting, A2 Hosting’s dedicated server will be able to complete your need. The price starts at $9.31 per month and is recommended for the very high traffic websites. You should understand whether you need a dedicated server or not. This is because dedicated servers are costly compared to shared and VPS hosting. Now let’s start and see the features of A2 Hosting in this A2 Hosting review. Here are some of the amazing features of the A2 Hosting which you should know for better utilization of the hosting services. This is one of the best features I found with A2 Hosting. The company uses SSD drives for all kind of products and hosting. But you should note that this is for OS and servers not for your files. A2 Hosting offers Swift cache which means it allows caching solution on the server. Turbo customers get access to their exclusive Swift Cache Site Accelerator. All you need to do is, just download their swift cache plugin and it will enable pre-configured caching to your websites. Turbo Cache- It automatically detects your CMS like WordPress, Drupal, etc. Your web page content will be stored in the turbo cache and will be served to the users from the cache without making another interaction to your server and databases. This helps achieve better speed. 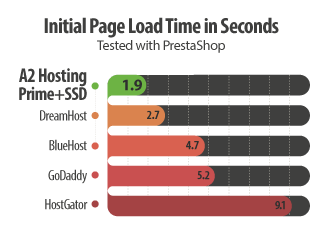 OPCache- It cuts the PHP page response time half and so enhance the performance and speed. It comes preconfigured with the A2 Hosting. I don’t think I should explain what CDN is, but still, if you are new, you can read this post to understand what CDN is and how it works. It will help you secure the website. This is the feature provided by CDN, no matter what CDN you are using. This is the top feature you will look for an A2 Hosting has succeeded in this. They provide 24x7 supports through different modes of communication including on-call. No matter what kind of issue you have, A2 Hosting support team is there to help you out. This gives extra feasibility. I still remember how support experience I had with DreamHost and this was the reason I moved from DreamHost. One thing I want to mention here is, almost all the Hosting companies claim to provide 99.99% uptime but most of them not. But with the better infrastructure and CDN, A2 Hosting is able to provide high uptime rate. If sometimes your server is down also, CDN will take care of it. As said, a2 hosting offers solutions globally and have datacenters located across the geography. This was all about an a2 hosting review. As stated above, a2 hosting is one of the leading web hosting solutions with BlueHost (check BlueHost review), SiteGround (check SiteGround alternatives), HostGator, and other similar companies. If you are a small publisher and manage multiple websites, I will suggest you go through swift shared hosting where you can host unlimited websites. If you have ever used a2 hosting, do share the feedback with us.